LIFE ?DRAWINGS? Satrapi has ?adapted her ?memoirs into ?the year’s most ?ground-breaking ?animated film.? Because the animated world is one in which anything may be conjured at will, from cars that talk to rats that cook, the ticket buyer seldom walks away from a big-screen cartoon with the sense of having just seen something he or she has never seen before. 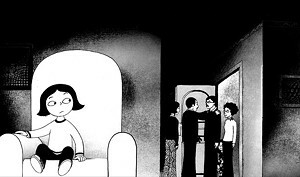 Persepolis is a different story: The combination of pen, ink and geopolitical strife has yet to yield anything quite like it. More than just another tale of a bright, rebellious girl coming of age, the movie follows a bright, rebellious girl coming of age in the midst of Iran’s Islamic revolution. Narrating the story is the woman she grew up to be — Marjane Satrapi, the author and illustrator of several internationally admired autobiographical graphic novels. Together with Parisian animator Vincent Paronnaud, Satrapi has adapted her books into a work of cinema that’s every bit as singular as the personal journey it depicts. For audience members who need a refresher course in Middle Eastern history, the first act, about Satrapi’s early family life, will contain a number of revelations. Raised by leftist intellectual parents and a fiercely feminist grandmother, she had passions surprisingly similar to those of most Western kids her age. She prized her Adidas, flirted with boys, taunted her teachers and blasted rock music in her bedroom. The secret police were easy enough for most people to sidestep, and, when the Shah was overthrown and exiled in the late 1970s, Iranians expressed widespread optimism that his departure would pave the way for a freer, more democratic society. Instead, a theological police state filled the vacuum, and government rule grew more repressive. But even as family friends were persecuted, and a beloved uncle was jailed and killed, the teenage Marjane retained her defiant spirit. Eventually her mother and father packed her off to Vienna, because they worried that her feistiness would make her a target for fundamentalist thugs. But Europe turned out to be a mixed blessing for Satrapi, who now lives in Paris. On the one hand, she was safe there from the horrors of the war that soon erupted between Iran and Iraq. On the other, she felt out of place among the students at her school — rich kids who posed as punks and nihilists. Again and again she found love and lost it. At one point, she drifted away from that milieu, behaved in increasingly erratic ways that got her kicked out of a succession of living situations, and ended up barely surviving on the street. Homesick, she returned to Iran a psychological wreck, only to find that the place she missed no longer existed. Clearly, we are far from Pixar country here. 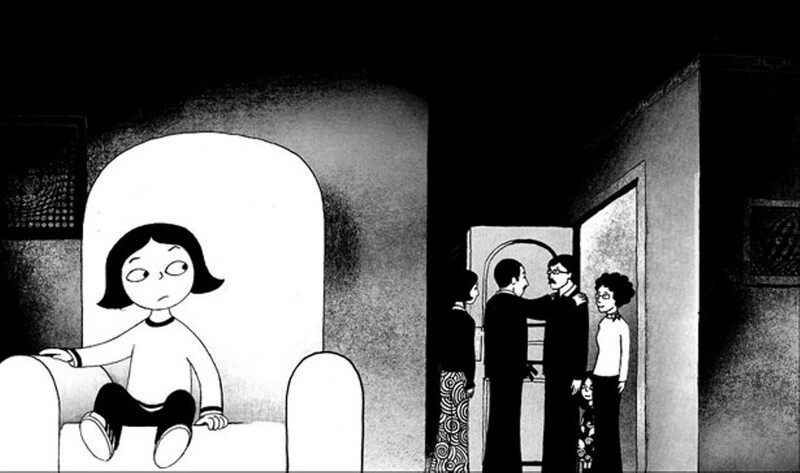 While Persepolis is ultimately a celebration of family bonds and individual resilience, the film has little in common with the candy-colored feel-good fare that’s come to dominate animation. Its palette rarely ventures beyond black and white, and its 2-D look is rooted in German expressionism. Nonetheless, the movie’s visual style is nothing short of exquisite. Its tone spans the gamut from exultation to despair. The jabs Satrapi takes at American policy are gentle, all things considered. As a child, she listened as her grandmother wish aloud that the Shah would “join his pals in Washington.” A family friend who’d been tortured related that his jailers had been trained by the CIA. As a young woman, returning to Tehran before leaving Iran for good, Satrapi was shocked to see the toll of the war on her homeland. She blamed Saddam for starting it, of course, but also implicated the United States for selling weapons to both sides. Persepolis covers a lot of ground. One of its many themes is the challenge of loving one’s country in spite of itself. In the course of 95 minutes, this film reminds viewers just how complicit our nation was in so much of the suffering that befell Satrapi’s. Today’s Americans can definitely relate.